These tomes have gone green. SILVER SPRING, Md. 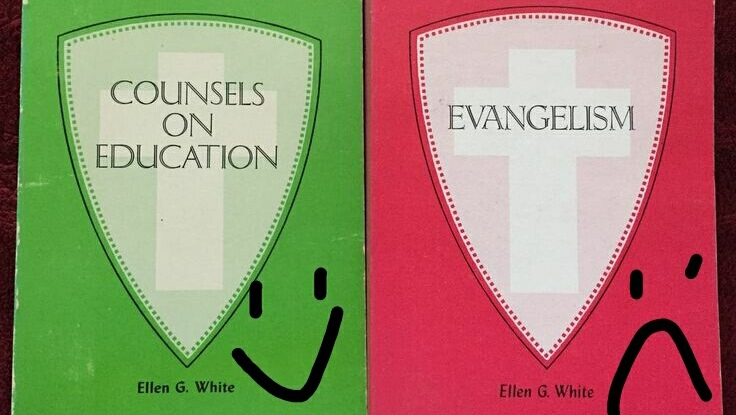 --- The Ellen G. White Estate has changed the officially sanctioned color of Ellen White book covers from red to green in honor of St. Patrick's Day. In a statement explaining the change, the White Estate said the color change was part of an ongoing effort to give White's books "the facelift they deserve." "We think a bright St. Patrick's shade of green will help Sister White's books pop more on the average bookshelf," said White Estate spokesperson Sonny Tarium. Although the color change had been approved earlier this year, Tarium said the White Estate had purposefully waited until St. Patrick's Day to make the announcement in order to capitalize on the holiday's inbuilt green craze. "We can safely say that this is the craziest thing the Adventist Church has ever done on St. Patrick's Day," said Tarium. RELYING ON EGW WRITINGS IS IS ALSO A SAD THING. “. . . in order to capitalize on the holiday’s inbuilt green craze” – more like in order for B.A. to capitalize on the crazy ad sales, web traffic, and AdSense revenue, not to mention their original goal of reaping Amazon Associate profits on sales of SDA-related items such as Veja-Links. Folks, this site will publish almost anything for a few bits of silver. . . .